The Red Raiders aerial assault challenges opponents on every play and lead the nation with 496 yards passing per game. Kyle Allen and the Cougars offense must keep pace in the air. The junior quarterback has been good this season; however, he must be great at home on Saturday in order too earn a victory. Allen effortlessly surpasses 300 yards passing and completes three touchdowns. The Mustangs employ one of the most explosive offenses in the country, averaging 49.3 points per game (sixth best in the FBS). Hicks deserves much of the credit for putting points on the scoreboard. The sophomore signal caller has posted back-to-back games over 300 yards passing and tossed eight touchdowns in three games. The Red Wolves will not be able to contain one of the best wide receiver duos—Courtland Sutton and Trey Quinn—in the country, and Hicks will get the ball into his playmakers’ hands. One of the best quarterbacks to target is a home underdog in a projected high-scoring contest. The Jayhawks lost two consecutive games, and the game script foreshadows a fourth-quarter deficit in which Bender and the offense must throw on nearly every down. The junior averages over 300 passing yards and two touchdowns per game. If in need of a quarterback, Bender is a sneaky option this weekend. Coach Bret Bielema’s offense features a dominant ground game. The Razorbacks are desperate to get the rushing attack back on track, and Devwah Whaley is the central player. The sophomore runner, who rushed for over 600 yards last year, has not been as dynamic as anticipated this season. Do not make the mistake of benching the Razorbacks’ playmaker this weekend. 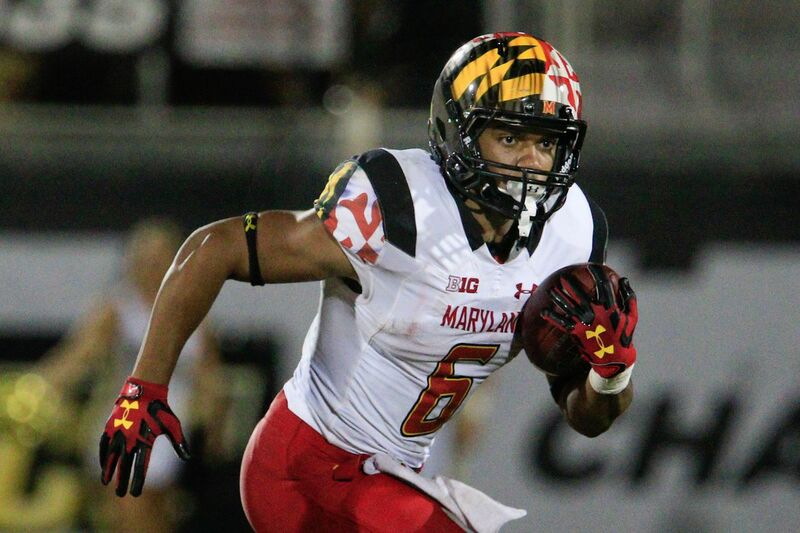 There is not a more explosive runner in college football than the Terrapins’ star. Examining the numbers, the production is astonishing (256 yards rushing) on such a limited workload (17 carries), averaging over 15 yards per touch. Johnson has scored three touchdowns and likely to explode for another two against the Knights. Against LSU, Aeris Williams illustrated his tremendous skills with 146 rushing yards on 23 carries. At 6’1” and 217 pounds, the junior has eclipsed the century mark in back-to-back games. A perfect complement to dual-threat signal caller Nick Fitzgerald, Williams provides the Georgia coaching staff with an extraordinary challenge: who does the defense take away? Fitzgerald is the bigger threat, and the Bulldogs runner continues his early season succes. The Aggies home run hitter should be owned in 100% of leagues. At 6-foot-6 and 215 pounds, the senior ranks among the top 10 wide receivers in college fantasy football with 22 catches for 295 yards and four touchdowns. The Miners defense allows a monstrous 50 points per game, and QB Tyler Rogers will target Scott all afternoon. Without question, college fantasy footballers are overlooking an exciting playmaker in Tempe, Arizona. Williams enjoys a positive game script: The Sun Devils are 14.5-point underdogs at home against a high-scoring Oregon offense. Last week against Texas Tech, Williams caught seven passes for 111 yards and two touchdowns. Arizona State likely trails in the fourth quarter, and the sophomore will be heavily targeted again. The Ducks might not have Charles Nelson, who suffered an ankle injury at Wyoming, against the Sun Devils, and Dillon Mitchell will be integral in the aerial attack. A sophomore, Mitchell has 13 catches for 156 yards and a touchdown in three games. Any starting receiver playing versus Arizona State is worthy of picking up off the waiver wire.